Kingdom of southwestern Germany. The earliest traces of Jews in this country are found in Bopfingen (1241), Ulm (1243), Esslingen (1253), Oehringen (1253), Calw (1284), and Weil (1289); and their numbers, as well as the places where they lived, may be ascertained by investigating the persecutions to which they were subjected by Rindfleisch and his followers (1298). Albrecht I. of Austria had been chosen King of Germany, and Ulrich I. and Eberhard I. were ruling in Württemberg, when Rindfleisch and his wild hordes attacked the Jews in Creglingen, Ellwangen, Forchtenberg, Gartach, Göglingen, Ingelfingen, Künzelsau, Leonberg, Mockmühl, Mergentheim, Stetten, Sindringen, Sontheim, Waldenburg, Weinsberg, Widdern, and Weikersheim. In the large community of Heilbronn alone there were 200 martyrs, among them Johanan ben Eliakim, the rabbi, and R. Asher, the president of the community. There was at that time a large community also in Ulm, which had its own cemetery,and which enjoyed certain privileges granted it by a municipal law of 1274, this law being in force in Ravensburg also. In the fourteenth century there were Jews also in Baldern, Geislingen, Göppingen, Schwäbisch Hall, Rohrbach, Hohenburg, Horb, Reutlingen, Rottweil, Stuttgart, Sulm, Tübingen, Vaihingen, and Wolfegg. The counts of Württemberg owed money to the Jews of Colmar and Schlettstadt, but Louis IV. canceled their indebtedness (1346), as had also Henry VII. and Louis the Bavarian (1311 and 1316) in the case of the citizens of Esslingen. During the night of April 19, 1316, the Bavarian party of Ulm succeeded in introducing Bavarian troops into the city, aided, as alleged, by a Jew. In the same night, however, the Austrian party, which was in the majority, appeared and drove out the Bavarians. In commemoration of this event a mass was instituted to recall the treachery of the Jews; but this was abolished in 1322, when the Bavarians gained possession of Ulm. New persecutions soon broke out, however, the Jews being charged with being enemies of the Christians, and with stealing and desecrating the host. The community of Esslingen was almost annihilated in 1334; and two years later the Jews in Hohenburg, Landenbach, Mergentheim, Weikersheim, and Widdern were persecuted. The situation became still worse toward the end of 1348, when the plague and fanaticism combined brought destruction upon the Jewish communities of Baldern, Bopfingen, Ellwangen, Esslingen, Göppingen, Geislingen, Schwäbisch Hall, Heilbronn, Hohebach, Horb, Krailsheim, Mengen, Mergentheim, Nagold, Oehringen, Ravensburg, Reutlingen, Rottweil, Stuttgart, Sulgen, Sulm, Ulm, Vaihingen, Waldenburg, Weilderstadt, and Widdern. For the protection afforded them the Jews of Ulm had to pay large sums to the municipal council, to the citizens, and to the counts of Helfenstein. The plunder taken from the Jews became a bone of contention among the cities, the emperor, and the counts; and their disputes led to renewed despoliations of the Jews. As the latter still found advocates, some counts and rulers united against them; and when the emperor's demand for a share of the plunder was unheeded, he made war against the cities, confiscated their possessions, and compelled them to pay high taxes. The city of Ulm being unable to raise the exorbitant sums demanded, the Jews came forward to aid it in its distress (1374), chief among them being Säcklin, son-in-law of Moses of Ehlingen, who was a citizen of Ulm. In order to exact money from the few wealthy Jews still residing in the city, the emperor declared them to be under the ban, and they had to pay large sums to have the edict revoked. In 1385 the federation of cities declared void all promissory notes held by the Jews within its jurisdiction; and in some cases it released the Christian debtors from paying interest on their loans, while in other cases it annulled part of the debt. Two years later the federation issued a decree that no German or Italian merchant might thenceforth have money transactions with the Jews. Emperor Wenceslaus, following the example of the federation, canceled in 1390 all the debts owing to the Jews, demanding, however, that the debtors pay him. All these measures were explained and justified on the grounds that the Jews were body and soul the property of the emperor, with which he could do as he pleased, and that the usury of the Jews had become intolerable. In spite of this, the counts of Württemberg permitted the Jews to reside in Stuttgart (1434), Kirchheim (1435), Tübingen (1459), Cannstadt, and Göppingen (1462), on definitely stated conditions, and on payment of large taxes for protection. Count Ulrich (1433-80) was commissioned by the emperor to protect the Jews, and at the same time rigorously to suppress their usury; the fines imposed were to be sent to the imperial treasury. Thus money flowed into the coffers of the count and of the emperor. Count Eberhard im Bart (1459-96) was a pronounced enemy of the Jews. He removed them from Tübingen in 1477; and in 1495 he decreed that they should be expelled from his dominions. This order was confirmed by decree of June 14, 1498; and the Jews of Ulm, who were wealthy and well educated, had to leave the city on Aug. 6 of that year. The exiles were deprived of their property; and the emperor demanded that the people of Ulm should mention him in their prayers because he had delivered them of the Jews. The fifteenth century was ominous also for the Jews of Ravensburg. A blood accusation brought against them induced Emperor Sigismund to burn some of the Jews of that city, and to expel others. The Jews were expelled from Esslingen in 1438; but ten years later they were again admitted, only to be expelled a second time in 1490. From Heilbronn, where Jews had settled anew in 1414, a number of them were expelled in 1469; and seven years later the city council insisted on a general expulsion, notwithstanding the imperial order to protect the Jews. The Jews expelled from the cities scattered among the villages; but in many cases they returned to the urban communities. Thus, there were Jews in Gmünd and Reutlingen in 1433; in Brackenheim, 1434; in Nersheim, 1454; in Giengen, 1486; and in Lauterburg, Pflaumloch, and Uzmemmingen, 1491. 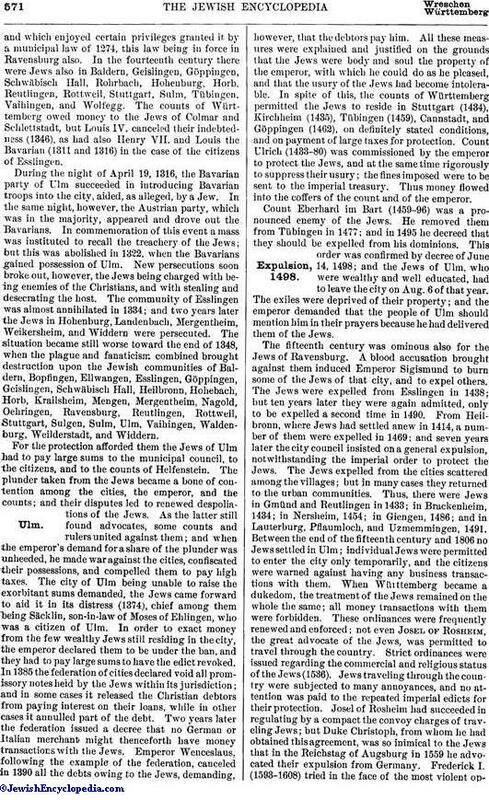 Between the end of the fifteenth century and 1806 no Jews settled in Ulm; individual Jews were permitted to enter the city only temporarily, and the citizens were warned against having any business transactions with them. When Württemberg became a dukedom, the treatment of the Jews remained on the whole the same; all money transactions with them were forbidden. These ordinances were frequently renewed and enforced; not even Josel of Rosheim, the great advocate of the Jews, was permitted to travel through the country. Strict ordinances were issued regarding the commercial and religious status of the Jews (1536). Jews traveling through the country were subjected to many annoyances, and no attention was paid to the repeated imperial edicts for their protection. Josel of Rosheim had succeeded in regulating by a compact the convoy charges of traveling Jews; but Duke Christoph, from whom he had obtained this agreement, was so inimical to the Jews that in the Reichstag of Augsburg in 1559 he advocated their expulsion from Germany. Frederick I. (1593-1608) tried in the face of the most violent oppositionto establish a Jewish mercantile association under the direction of Maggino Gabrieli and a Jewish magician, Abraham Calorno; the attempt, however, was an absolute failure. During the reign of Eberhard Ludwig (1677-1733) a favorable change of attitude toward the Jews took place; and they were now permitted to frequent the fairs (1706) and to trade in horses (1707). The Countess of Würben procured the privilege of free trade for the Jews of Freudenthal (1728) and for those of Gochsheim (1729). Under Carl Alexander (1733-37), Joseph Süss Oppenheimer was appointed privy factor, and subsequently financial councilor, to the duke; and through his influence several Jews were permitted to settle at Stuttgart and Ludwigsburg. Oppenheimer's subserviency to the duke brought upon him the enmity of the people, and after his master's death (1737) he fell into disgrace. He was executed in 1738, and in the following year all the Jews were mercilessly expelled. They were soon permitted to return, but they were severely restricted in the exercise of their religion, as well as in their business; and the people were warned against having any dealings with them in monetary affairs. Court factors were treated more leniently, and important government contracts were given to them (1759, 1761, 1764) in spite of the objections of the populace. Karl Eugen, as also his successors, Ludwig (1793-1795) and Friedrich (1795-97), treated the Jews considerately. These rulers were the last of the line of Catholic dukes; and under the succeeding Protestant régime a new era dawned for the Jews of Württemberg. With the nineteenth century the whole country received an entirely new political constitution. It was not only made a kingdom, but considerable territory was added to it (1806); and its Jewish population increased until in 1828 it numbered 8,918 souls. King Frederick I. (1797-1816) took the first steps toward the emancipation of the Jews. He annulled the body-tax and admitted the Jews into the army (1807); instituted family registers; included the Jews in the general taxation (1808); opened up to them all trades; and regulated the organization and government of their communities. The Jews so treated showed themselves loyal citizens during the Napoleonic wars. The work of ameliorating the condition of the Jews was continued by William I. (1816-64), and completed under Charles I. in 1869. 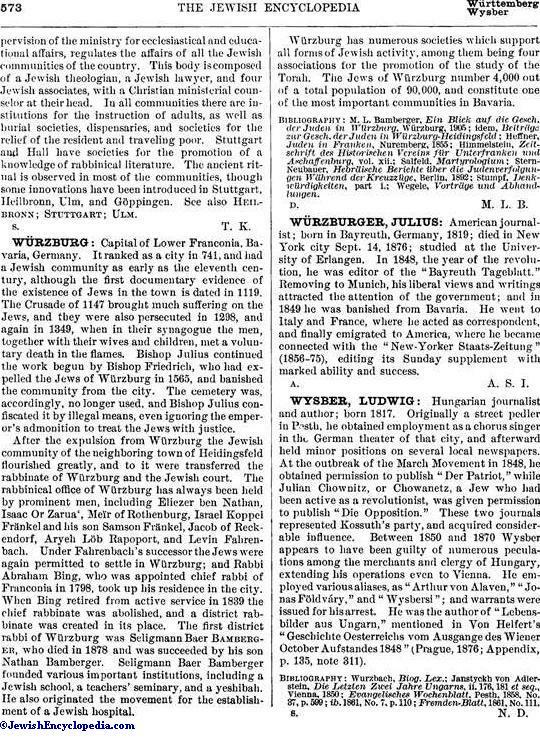 King William instituted the Israelitische Oberkirchenbehörde; and, by a law enacted in 1828, he regulated the constitution of the Jewish communities, and made it obligatory upon Jewish parents to let their children receive a common-school education as provided by the general school-law of 1825. In the work of purifying the worship from the neglect and irregularities that had crept in, Dr. Maier, as theological member of the Oberkirchenbehörde, was most active. His aim was to eliminate completely all non-German elements, and to approach as closely as possible to the culture of the time, maintaining the idea of Jewish unity and morality, while abandoning the specifically Jewish laws of exclusion. Similar ideas actuated his successor, Church Councilor Dr. von Wassermann (1872-1893). Most of the communities in the northern part of the country clung, however, to the Hebrew language and to the Biblical and Talmudic rules of life; and at present the majority of the Jewish children are instructed in Hebrew, while the form of worship has remained almost unchanged. According to the census of 1900, the Jews in the kingdom of Württemberg numbered 11,916 in a total population of 2,169,480. They thus constitute 0.54 per cent of the population, distributed among the four districts of the country as follows: (1) Neckar, 5,544, or 0.73 per cent; (2) Black Forest, 1,296, or 0.25 per cent; Jagst, 2,990, or 0.74 per cent; and Danube, 2,086, or 0.40 per cent, of the total population. The Neckar district is divided into five rabbinates, the seat of which is in Stuttgart; the Black Forest district constitutes one rabbinate, the seat of which is in Mühringen; the Jagst district embraces the rabbinates of Heilbronn, Oberdorf, Mergentheim, Braunsbach, and Weikersheim; and the Danube district, the rabbinates of Göppingen, Laupheim, Buchau, and Ulm, making a total of fifteen rabbinates for the kingdom. Laws and decrees regulating the communal affairs were issued as follows: April 25, 1828; Oct. 27, 1831; Jan. 31, 1834 (rabbinical examinations); 1838 (rituals); 1841 (duties of rabbis and choir-leaders); March 25, 1851; March 26, 1873; Feb. 22, 1875; and Feb. 18 and April 24, 1876 (taxation); Aug. 5, 1875; and April 23, 1900 (pensioning of rabbis); and July 8, 1878; and March 25,1900 (qualifications of choir-leaders). 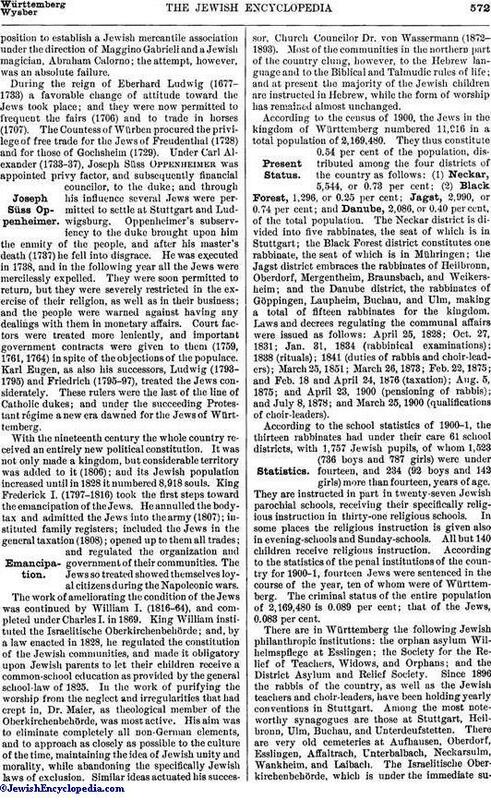 According to the school statistics of 1900-1, the thirteen rabbinates had under their care 61 school districts, with 1,757 Jewish pupils, of whom 1,523 (736 boys and 787 girls) were under fourteen, and 234 (92 boys and 142 girls) more than fourteen, years of age. They are instructed in part in twenty-seven Jewish parochial schools, receiving their specifically religious instruction in thirty-one religious schools. In some places the religious instruction is given also in evening-schools and Sunday-schools. All but 140 children receive religious instruction. According to the statistics of the penal institutions of the country for 1900-1, fourteen Jews were sentenced in the course of the year, ten of whom were of Württemberg. The criminal status of the entire population of 2,169,480 is 0.089 per cent; that of the Jews, 0.083 per cent. 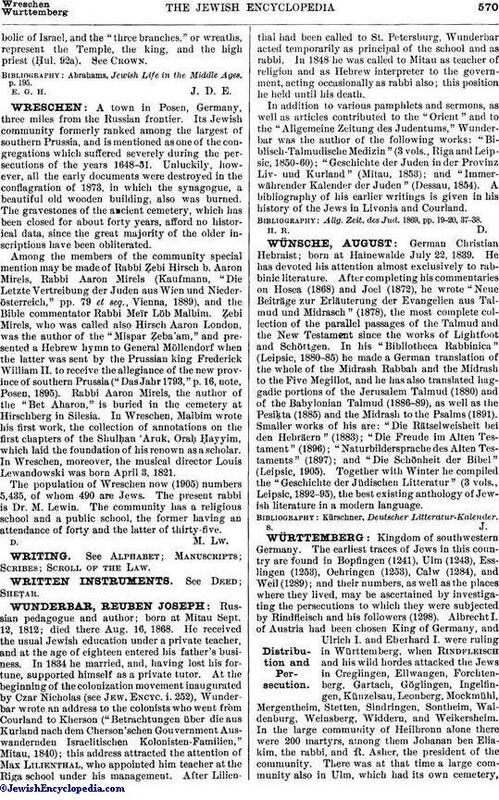 There are in Württemberg the following Jewish philanthropic institutions: the orphan asylum Wilhelmspflege at Esslingen; the Society for the Relief of Teachers, Widows, and Orphans; and the District Asylum and Relief Society. Since 1896 the rabbis of the country, as well as the Jewish teachers and choir-leaders, have been holding yearly conventions in Stuttgart. Among the most noteworthy synagogues are those at Stuttgart, Heilbronn, Ulm, Buchau, and Unterdeufstetten. There are very old cemeteries at Aufhausen, Oberdorf, Esslingen, Affaltrach, Unterbalbach, Neckarsulm, Wankheim, and Laibach. The Israelitische Oberkirchenbehörde, which is under the immediate supervisionof the ministry for ecclesiastical and educational affairs, regulates the affairs of all the Jewish communities of the country. This body is composed of a Jewish theologian, a Jewish lawyer, and four, Jewish associates, with a Christian ministerial counselor at their head. In all communities there are institutions for the instruction of adults, as well as burial societies, dispensaries, and societies for the relief of the resident and traveling poor. Stuttgart and Hall have societies for the promotion of a knowledge of rabbinical literature. The ancient ritual is observed in most of the communities, though some innovations have been introduced in Stuttgart, Heilbronn, Ulm, and Göppingen. See also Heilbronn; Stuttgart; Ulm.